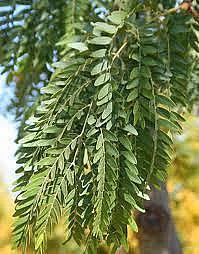 Shademaster Honeylocust (Gleditsia triacanthos 'Shademaster') has a rounded canopy and provides light shade that allows sunlight to filter through, making this a good tree for use near a lawn. It is thornless and seedless, growing 40 to 45 feet in height. 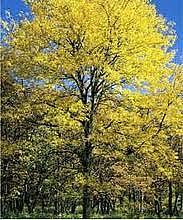 Hardy to zone 4, this tree is tolerant of urban conditions such as poor soils, a wide pH range, soil compaction, flooding, salt, heat and drought. Foliage is bright green, glossy, and late to appear in spring. The leaves are alternate and pinnately compound and about 10 inches in length. Foliage in fall is bright gold and drops early. Bark on a mature tree is gray with plates and fissures that reveal an orange interior bark. Young bark is smooth, grayish-olive in color.